Many years ago, while on family vacation, I decided to take a detour to visit a plantation that had acre upon acre of original Victorian gardens. Once there, I was overcome with joy to see such beautiful flowers, green foliage, and ornate iron work. To my surprise, a groundskeeper approached me and began to ask why I was so excited over particular sections of the garden. I explained that the beautiful foliage was breathtaking, and it truly filled in the areas between the blooming flowers. To his dismay, he shook his head and began to tell me what I was looking at. The gardens had been taken over with weeds that had been imported with the bulbs. The garden was dying slowly because the weeds were killing the flowers. Today, as we look around at the world, we see beauty, and we see that the world taken over by things that are choking out life. Evil is choking out life. We as Christians need to be as the Gardener, fighting to uproot wrong, and nurture right. We must let our light shine of Jesus, so we may rightly detect the evil that has been imported with the good. Keep a watchful eye! Prayer: Heavenly Father, give us the courage to confront evil and weed it out of our lives. Amen. Today’s devotion was written by Joshua Morgan, Pastor at Advent Lutheran Church in Kings Mountain, NC. There are many false prophets today who, like the story, look so beautiful to the eye, yet they teach a false doctrine. That being said, how many of their disciples go out and spread that same false doctrine in the hearts of others. 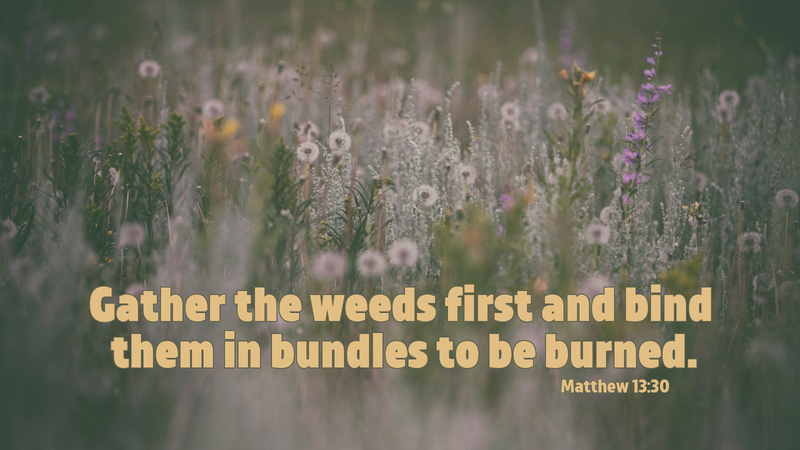 It is our responsibility to weed out these weeds that choke out the life of those who follow their prophets. Our knowledge needs to be based on the Bible alone, testing each word that is spoken by teachers of the word. This, in our end times, is more relevant than ever.